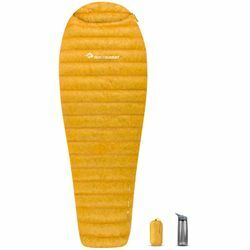 Sea to Summut Spark Sp0 50 Sleeping Bag. The Spark™ Ultralight Sleeping Bag Series spans everything from an ultralight down-filled liner to a mid-winter fast-and-light sleeping bag. Each model uses premium materials and no-frills design to provide cutting-edge performance for the designed end-use. Ultralight does not mean ultra-tight: The Spark sleeping bags are snug but still have adequate girth for the performance-oriented backcountry user. IS THIS DOWN SLEEPING BAG…? Suitable for cooler temperatures? Yes. You would want the Spark 5°F or possibly the 18°F – either bag will work in late Fall, the 5°F will take you down to winter temperatures when paired with an adequately insulating sleeping mat like the Comfort Light Insulated. Really suitable as a sleeping bag liner? Yes. You could use the Spark 50°F, or even the Spark 40°F or 28°F to boost the performance of a bag for cold-weather use. Adding one of these to a 20°F / -5°C bag might make more sense than buying a “0°F / -20°C” bag for only occasional winter use. Able to be zipped to another sleeping bag? No. Even though the 18°F or 5°F have full-length side zippers, they are not designed to be coupled to a sleeping bag with a right zipper (for instance the Flame 18°F or 5°F). Baffle construction: 50°F and 40°F have sewn-through construction. | 28°F has baffles in the torso and sewn through in the leg area. | 18°F and 5°F are fully baffled.